I sulked about the World Cup being in Russia for some time. Russia the drug cheats. Russia the racist, homophobe country. Their bid was nowhere near as good as England’s. But I mainly sulked because there was no way I was going to offer my puny body as a sacrifice to the well trained, politically-endorsed hooligans that Russia sent to Marseille in 2016. I was going to have to stay at home and watch the World Cup from my sofa. Don’t get me wrong, I’m not that fond of many England fans either. I witnessed them in Albufeira during Portugal 2004 and not that many act as national ambassadors. Some do by the way! But having written books on Portugal 2004 and France 2016, I ended up sampling the atmosphere of those tournaments without following England at matches and, for the most part, had a great time. In France I enjoyed the party atmosphere created by the Welsh in Lille. I’m glad they enjoyed it while they could. I was also sulking (I sulk a lot as a Southampton fan) about England losing to Iceland. Normally the sort of underdog story to warm the heart, it made my non-football fan friends smile. But not me. 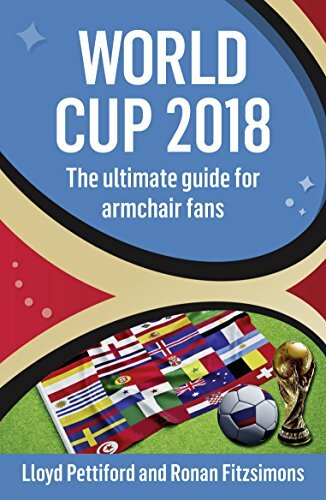 The book Ronan and I wrote as a guide to Euro 2016 was selling nicely until that game (as English glory beckoned) and then sales fell off a cliff after defeat. In vain did the publisher ship copies to Cardiff and Reykjavik. So there was no way I was going to write another ‘Guide to…’ football tournament book for Russia. Then one day I stopped sulking. It happens. And it came to me. There must be others like me, who are still going to watch it on TV. Who can’t help being interested, but are staying at home. If previous guides haven’t been exactly Lonely Planet they’ve attempted a bit of culture, a bit of a sense of what you might expect if you go. But why not write a book that encourages people not to go? Something light in all respects, that fans could pop on the sofa next to them and look at at half-time or in the gaps between matches. Or leave in the toilet for penalty shoot outs? The real bonus in doing so was another chance to work with Ronan who is genuinely a funny man. So we set ourselves the brief of writing something which tells people about the World Cup in a light-hearted fashion. How teams got there, why others didn’t (including contributions from American and Dutch fans), which players to look out for, the tournament schedule and even a dispassionate look ahead to Qatar 2022 etc. And we’ve thrown in things to surprise the casual reader. The story of the greatest Russian footballer ever (who nobody has heard of). And compelling evidence that England are as good as Germany. Bizarrely, since high sales will probably only arrive if England reaches at least the semi-final we also found a publisher crazy enough to give it a shot. In short, it was fun to write and stopped me sulking. We think it’ll be fun to read too. WORLD CUP 2018 – THE ULTIMATE GUIDE FOR ARMCHAIR FANS, by Lloyd Pettiford and Ronan Fitzsimons and published by Urbane Publications, is available now from Amazon and all good bookshops for a very reasonable £6.99.